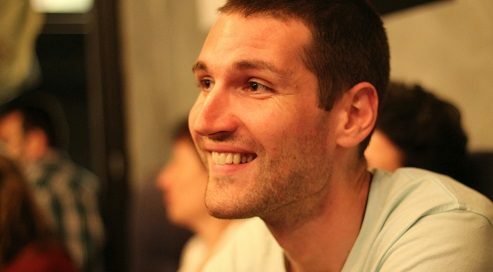 Andrei Dósa (1985) was born in Braşov, Romania. He made his literary debut with Cînd va veni ceea ce este desăvîrşit (When completeness Comes, 2011) for which he received the Mihai Eminescu Opera Prima National Award of Poetry and the Iustin Panţa Debut Prize. For his second book, Cartea Românească (American Experience, 2013), he was awarded the Young Poet of the Year prize at the Young Writers’ Gala. Recently, he published his third book Nada (2015). He has contributed to the literary magazines Poesis International, Astra and Corpul T, and to the Club Literar website and the Lumina de Avarie writing workshop. He also works as translator of Hungarian literature into Romanian, mostly translating contemporary poets, including György Petri, István Kemény, and Szilárd Borbély, but also novels by Dezső Kosztolányi and Magda Szabó. Andrei Dósa was selected as one of Literary Europe Live‘s New Voices from Europe 2017.